I was revisiting the Lake Herman Road crime scene pictures and realized that one of the images widely available on the internet is a composite posted by a contributor on the zodiackiller.com message board, constructed using 3 different crime scene photos. This image is in fact totally wrong and has been the basis on which I have argued that Betty Lou Jensen was discovered 8-10 feet from the rear of the Rambler. In addition this composite gives the impression that Betty Lou Jensen was lying at a virtual right angle to the Rambler, which is also false. Betty Lou Jensen was found 28 feet from the rear of the Rambler, her feet facing west. The Rambler was facing southeast. Using original black and white photographs of the crime scene, the true picture can be revealed. Below I have placed two red dots on the lower blood trail from David Faraday. When joined together it gives us a directional marker (blue line) pointing directly to the front wheel of the Rambler. Next I will take the widely available composite image from the forum post and perform the identical task. It can be clearly seen that the blue line is pointing nowhere near the front wheel of the Rambler, indicating it has been constructed incorrectly. The author of the forum post was justifiably trying to create a better feel of the scene at Lake Herman Road, which he did. The error was on my part for not realizing it was a composite or reconstruction, believing it to be a real crime scene photograph. Below is a real photograph of the crime scene from the back of the turnout. The policeman in the distance is pointing his flashlight at the bloodstains of Betty Lou Jensen, at the northwest side of the turnout. The fence posts can be seen on the left of the image. The yellow line shows the relationship of her body to the lower blood trail from David Faraday. It is at an approximate right angle of 90 degrees. Betty Lou Jensen is only marginally off line to the axis of the Rambler. In the composite photograph above, the lower blood trail from David Faraday is directed towards Betty Lou Jensen's head. One can see in the photograph below, it is pointing nowhere near Betty Lou Jensen. How do we know that the policeman is directing his flashlight at the bloodstains of Betty Lou Jensen? Here is the image (below) taken from the newspaper of the day. Detective Sergeant Les Lunblad is pointing at the blooded area where David Faraday was felled by one gunshot to his head. In the distance Russ Butterbach is looking at the bloodstains from Betty Lou Jensen. ​Using the newspaper image of Russ Butterbach and the wide angled view of the turnout, we can now reconstruct the composite image to how it should really look. The final piece in the jigsaw is to show an overhead view of the turnout, using an image from Google maps. 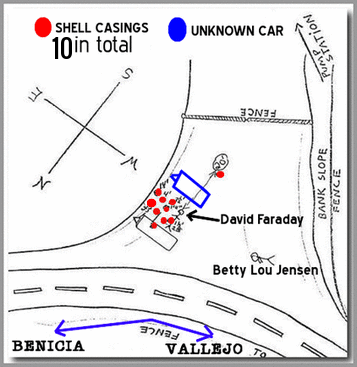 Although the turnout has changed over the intervening years, the following are the relative positions of the Rambler, David Faraday and Betty Lou Jensen, that now tally almost identically to the police sketch shown here. The Rambler is facing southeast. If a line is drawn through the bloodstains of David Faraday to Betty Lou Jensen's head, the white arrow above heads north northwest, offline to the direction of the road (following the path of the green line below left). The Rambler is virtually parallel to the white line. This too can be seen here in the photograph below right. The Rambler's back wheel would be by the red circle above virtually parallel to the green line. Hopefully this finally sets the record straight. ​View from inside the turnout facing Vallejo. View from inside the turnout facing Benicia.